C. Robert Biondino Jr. will do everything possible to help you win your case. We will listen to you and work diligently to understand your unique family case. We will use our many years of experience to devise a carefully considered strategy to achieve the best outcome in the Broomfield area courts. 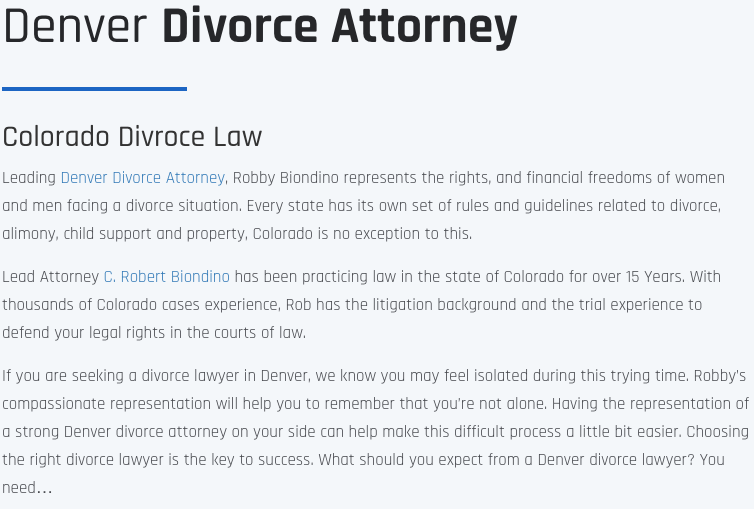 AT C. Robert Biondino Jr., mediation, arbitration and other forms of counseling can help you dispose of your case in the Broomfield area quickly and cost-effectively. With our knowledge of family cases we are trained to assist in those processes. While our case work is important, C. Robert Biondino Jr. keeps its office management in top shape. At C. Robert Biondino Jr., we know that each family related matter that we take on is as unique as each client we represent. When you work with C. Robert Biondino Jr. in the Broomfield area you will receive personal attention, vigorous legal representation, and be directly counseled. Dealing with family matters can have drastic effects on your family in the Broomfield area. Let us at C. Robert Biondino Jr. handle your legal matters so you can tend to your family. Call (303) 931-5516 and enlist our many years of experience today.